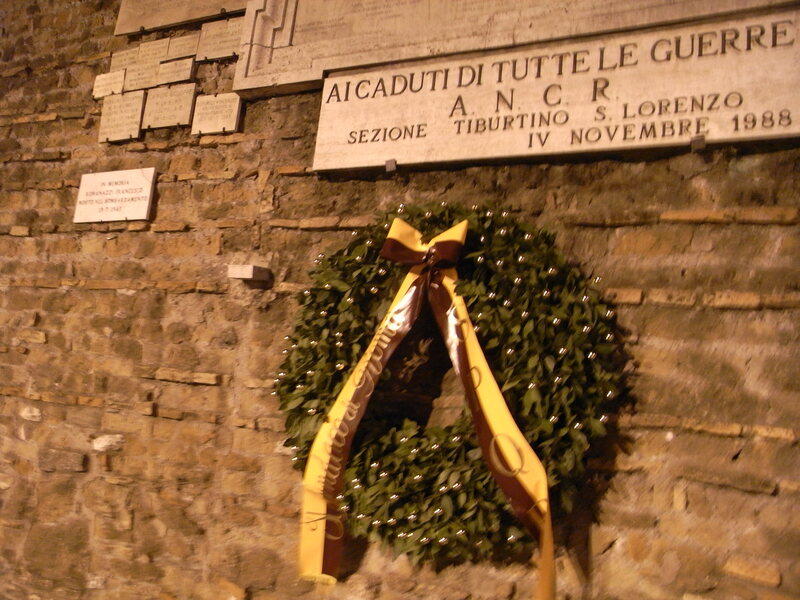 Every year when the cinemas en plein air diffuse plots in the Roman night and pizzerie invade extravagantly the pavements making the city a giant living room, it is so strange to remember that on a July night San Lorenzo was bombed by the Americans. 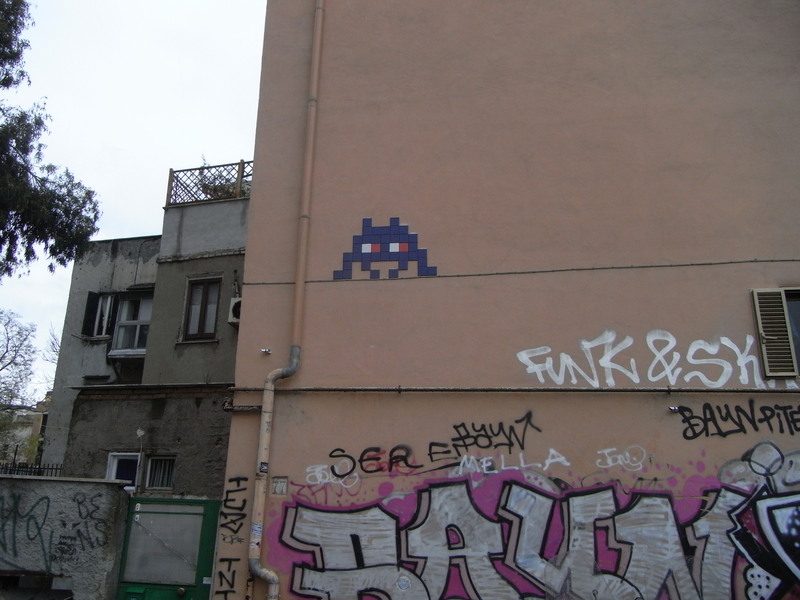 Space Invader is now in Rome. We’ve spotted his signature in Piazza Fiume, in San Lorenzo, in the Pigneto. The appliqué graffiti are bigger than the ones I used to spot in my Paris years in the 90s. But I like them. They’re reassuring little urban pets. There are so many secret palaces, parks and cloisters in Rome. During the weekend we venture out hoping to catch a glimpse of a museum reopened after a decades-long restoration or of a roman villa at the exclusive use of the military or some obscure association, union or society. This morning the weather forecast announced bad weather for the coming week, so we were even more eager than usual to get out and profit of the fabulous ottobrata romana. Since next weekend we will be celebrating the fall of the Berlin wall, we walked along the bits and pieces of Roman walls still standing, the Mura Aureliane. Starting at Porta Tiburtina in San Lorenzo (yes, yes, behind the railway station) we walked until Porta Maggiore, where not less than 8 water aqueducts converged. Here, following the remains of the wall, opposite Villa Wolkonsky you can still see the section of the wall and 3 ancient Roman water pipes made of laeteritium and lead. The diameter of the pipes and the descending slope tell us that the Villa which was served could definitely pay plenty of taxes (diameter) and had probably many fountains (slope). In fact we are right at the edge of Villa Wolkonsky . The pipes are visible from the traffic light stop on Via Statilia and Via Santa Croce di Gerusalemme (top left corner in the picture). From the corner you can glimpse some bassorilievi, opus reticulatum and the columns of a circular temple. From the street a high wall protects the Villa which hosts now the British Embassy, part of war reparations. You can see some pictures of the interior of the inaccessible and mysterious Villa Wolkonsky in the August 2009 Daily Mail article attached below (to be honest, I would never eat the CO2-rich marmalade made with the oranges which grow on Rome’s trees, even if from Villa Wolkonsky!). Sandwiched in between Villa Wolkonsky and San Giovanni al Laterano is the Teatro Sala 1 where Friday night we saw Les Liaisons Dangereuses starring our friend Cristina in the role of the cruel and glamorous Madame de Merteuil. This is another bit of secret Rome…the theatre entrance is hidden by the bus stop and is very small, but the atmosphere is magic: vaulted brick walls and a truly conspiratorial mood. Today we popped in at San Giovanni in Laterano because we knew that the cloister would be so beautiful with the sun, given its jet black-red-gold Cosmateschi mosaic. We then continued our quest for inaccessible Rome crossing the Celio hill, and wondered at all the beauty that is lost: the gardens are mainly closed and host buildings of the military hospital. Once again another Roman treasure (like portions of Palazzo Barberini) for the exclusive use of the military and forbidden to the citizens. We don’t like this sort of exclusivity. A nice surprise: after many unfruitful expeditions, this time Santo Stefano Rotondo was open to the public. The church has been recently restored, beautiful rust metal lights hang from the rounded ceiling and illuminate the extremely gore frescoes showing all sorts of tortures, San Lorenzo in the middle of the flames and the like. Well, time for getting out of the church, for a glass of wine and more sun before the official kick off of winter! David Miliband was at the centre of a new row over politicians’ perks last night after he admitted enjoying three nights in the glorious residence of the British Ambassador to Rome as part of a family holiday to Italy. Hanami is also in our street, next to the Castro Pretorio, the barracks of the roman praetorian guards. Friday and saturday, true spring days in Rome. Those obliging tourists to stare at the air and smile. And romans do the same. A scented fresh wind, petals swirling in the air. Or around the corner, close to our local caffe’ in our neighbourhood next to San Lorenzo…under today’s overcast sky. I am halfway through Colin Crouch’s book “Postdemocracy” but reality caught up much faster today. Today the police attacked the students at the Universita’ La Sapienza. They were trying to join the strike in the city center but were blocked and pushed back into the campus. The new regulations on protests by Rome’s mayor+the police are now in full force. One year after the election, matraque oblige. It happened here, close to home. An ordinary day. This morning I bought the newspaper at the kiosk opposite the Sapienza, had breakfast at one of the students’ bars around the corner. Busy day in the office, many meetings, many calls, I didn’t check the news at lunchtime. It was sunny, I went for a sandwich at Piazza Colonna. An ordinary day? It’s only now after dinner that I find out what happened today, on the internet. I see if there’s something about this o TV, but we’ve got a talkshow covering a dancing contest, a talkshow debating a reality show, a talkshow stuffed with politicians, a history documentary on the Battle of Berlin. I try to download the local news from Rai but it doesn’t work. It’s always like that. Student citizens are the first to be attacked. While other citizens are at work and don’t notice. Shocking. It’s happening now. Welcome to postdemocracy, where you pay taxes for these “services”. Btw, TG3 reported on this a few minutes now, 00.50, I guess the same few frames they broadcasted at prime time. You will find photos and videos here. La Sapienza The Wave movement communique’ is here. (The Wave is the translation of the movement’s name, L’Onda – nothing to do with the german film). Categories: Friends, History, Mein Mann, multikulti, Rome, Sense of Place, Softdrinks and Trains! Where can you find the best cornetti (or croissants) in Rome? Where can you sit down in a cozy interior or on a leafy terrasse without being ripped off? Where can you see the last pini marittimi of the Pigneto, in between the Casilina and Prenestina roman roads? Where, more importantly, can you hang around Pasolini’s neighborhood and sip your cappuccino right on the set of the film “Accattone”? At Bar Necci 1924 he cappuccino is good, but the croissants, pains au chocolat and danish are su-perb. No semi-industrial rechauffe’ pastry here. Butter-rich croissants filled with creme patissiere with a hint of lemon, excellent danish (or caracoles)…and a very cosy living-room where DIY helps keeping prices reasonable and the community happy. That’s the kind of value added that Mr Brule’ would call “Attention to Retail”…and that justifies us parting with our beloved Euros. Also, in this bar you can do a stop over on our European Regional Softdrinks Tour because there is another brand of Gazosa, Bitter and Spuma, typical old-fashioned italian pre-coke refreshmens: Paoletti. Basic packaging, green mineral-water-style bottles with a colorful a’ la p(l)age label. ….and talking about optical graphic black and white, at the Bar Necci advertising from the 70s is a treat…! Well, it has been very rainy in Rome lately. I mean, since last May we had lots of rain. Now, when it rains Rome loses all its charm. This is not mineral Paris. Not shiny red-brick Ferrara or misty Venice. With the rain Rome is plain ugly. This is a town built for blue skies, cold or raging hot, but definitely dry weather. So during the rare sunny days of this winter the blue/orange contrast was even more surprising even for us, spoiled locals. Ok ok, the Centro Storico is fabulous. Still are you interested in going beyond? In no-postcard zone? Well, you’re lucky, there is a special reportage today on the eastern borders of town, where we live. We’re outside the city walls. Still, it’s plenty of Roman rests here…acquedotti in San Lorenzo, the roman barracks of Castro Pretorio, and the remains of the consolari: Tiburtina, Casilina, Prenestina…Nomentana…but this was Roman Countryside when Goethe was doing his inter-rail tour. And it remained like that for a while. Ever heard about the “lotti”? This was a sort of social housing of the early 20th century. As in Berlin or London, probably in those years social housing hit its zenith. Houses mimicking the rural set up, in continental Europe with more of a village feeling compared with the already very industrialized England. Buildings never too big, created with a strong user experience aim. Having in mind playgrounds for children, places where to hang the clean laundry to dry, a bit of greenery, and possibly also architectural charm. I took some photos of the lotti behind Piazza Bologna, the area where MeinMann grew up. One century ago here flocks of sheep would gaze the distant horizon. And they did still exist in the 1950s, when the parents of MeinMann came to Rome and the 1960 and 1970 tall periferie hadn’t clogged the horizon yet. We’re in a recently built neighborhood. Never been here? Nothwithstanding the bad weather we got so far, the mimosa trees are about to blossom…typical for January in Rome. If you want to do your Spazierengang among ladies going to the market with their trolley, want to meet a grumpy gattara*, hear conversations from balcony to balcony come here. You will not see “trendy” bars, meet expats by the hundred, the odd soap-opera actor posing at the caffe’ or bo-bos. Real Rome, if you are interested in the merchandise. Some still retain their reddish patina of pozzolane, a reddish paint done with vulcanic stones, which is wearing out in Rome and compares to in-the-face orange industrial paint like pastels to stabilo-boss. There are squares for the kids to play (the Campo Sportivo Artiglio kids soccer club is behind the corner), even if kids are a rarity now. There are clustered courtyards surrounded by a fence, for hanging the washing up out to dry without that soccer interferes with it or visitors mess around. *lady (or man) taking care of our several cat communities, one day I’ll speak about the roman cat communities!